In the past week, Montreal foodies Anthony Kinik and Michelle Marek were guest-bloggers here at BudgetTravel.com. If you didn't catch all their posts, here's a round-up. 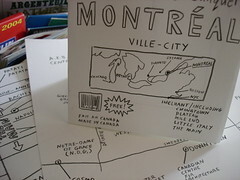 Anthony and Michelle have created online city maps of Montreal, which point out the locations of gourmet hotspots. Here are some of Anthony & Michelle's favorite Montreal eateries, bakeries, and bars. Here's a taste of life in Quebec. It's Time for Ice Cream Sandwiches! Try this gourmet recipe and learn the story behind its invention. Anthony & Michelle quiz several Montreal gourmands about their favorite places to eat...and other matters. The story of a relaxed July day with food and friends in Montreal. And be sure to check out their wonderful blog, "...an endless banquet."